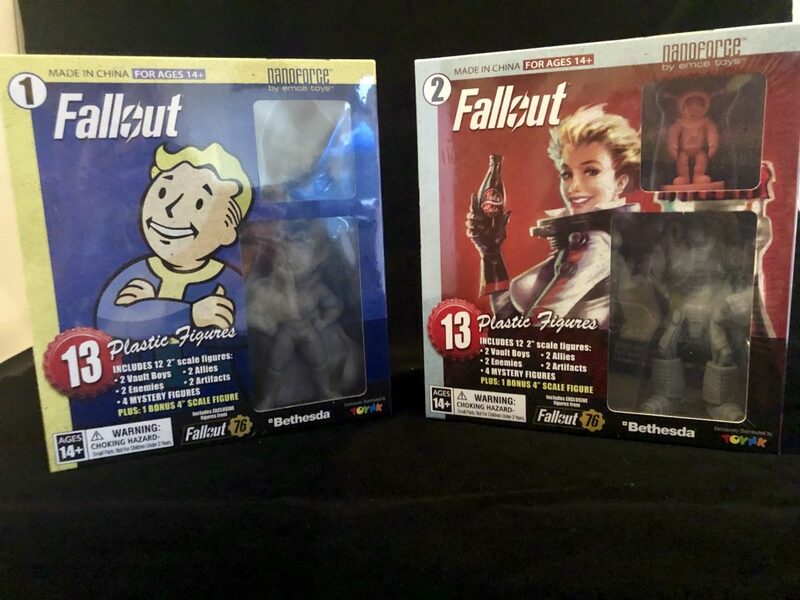 Fallout Nanoforce Series 1 Army Builder Figure Collection -Boxed Volume 1 & 2 – AiPT! Back in December I reviewed the Fallout Nanoforce Series 1 Army Builder Figures. Our friends at Toynk decided that I needed to see more of these fantastic little guys so they sent me the boxed volume 1 and 2 of the Fallout Nanoforce Series 1 Army Builder Figures. Yes, these are the same ones in a bigger box, so why am I reviewing them again? Differences in the collections! These boxes are a better bang for your buck, in my opinion. In each of the boxes, you receive 12, 2″ scale figures: 2 Vault Boys, 2 Allies, 2 Enemies, 2 Artifacts, 4 mystery figures, and 1 bonus 4″ scale figure. I stand by my opinion in my first review. These little guys are pretty cool! The figures are solid plastic, have a nice weight to them, and are very durable. There are certain figures in the set that are more bendable compared to others, but you aren’t going to risk breaking these guys unless you accidentally step on them or force them to break. Standing in at only 2 inches tall, the details are incredible. The Allies are my new favorites and I love the detailing in the Power Armor figures. The bases are sturdy and will not fall over easily due to an imbalance between figures and base. The bonus 4″ figures are a cool addition to these boxes. Each volume comes with its own respective 4″ figure. Volume 1 has the “Toughness” Vault Boy Perk and volume 2 has Liberty Prime. Another nice addition with the boxes is a fold out display that has each of the characters names typed on the paper so you can place them there. Overall, I am a fan of these figures. It would have been nice if the fold out display wasn’t paper. I would have shelled out a few bucks for a sturdier display. But it is better than nothing. When it comes to buying the Nanoforce Collection these boxed volumes are the sure bet. I got duplicates in the boxed volumes that I had received already in the bagged versions. Unless a certain figure gets lost or broken, I would purchase the boxed volumes. Plus you can’t go wrong with the 4″ bonus figure! Get your Nanoforce Collection here at Toynk.com! A great collection of figures for any Fallout fan! The details in the figures are great! Tough and durable! These figures will hold up. The mat display is paper, get it laminated.